Exclaim! 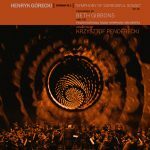 is impressed with Beth Gibbons’ rendition of Henryk Górecki’s Third Symphony, writing that, “in the hands of Gibbons, the orchestra, and conductor Krzysztof Penderecki, the music slides from doomy lurches to shimmering sweeps to, occasionally, gorgeous reprieves from its own grievous weight. The orchestra carries its countryman’s music with sheer orchestral brio, and Gibbons — who had to learn the text without knowing Polish — pushes her voice into its highest echelons, tapping into the latent power of the piece, and humanizing its sentiments with raw affect.” Read the review here.